Despite her tender age, Leila is becoming quite the discerning shopper. Not that she has access to my debit cards or Paypal account you understand… but she does have access to the three bottom drawers of my Ikea Helmer (when I’m not looking). …and now she won’t give it back. It’s the sheep you see… Lady Lamb has captured her imagination and her heart, everytime I try to steal a squeeze… my attempts are met with tears. I’ve been using the Lanolips 101 ointment on L since she was a tiny one to dampen the eczema on her face and because she was always swaddled at night as a babe, the thick lanolin used to work wonders at taking the edge off the itch. Perhaps something in her subconscious recognises this lanolin-based counterpart, the only other beauty product to have awoken her magpie tendencies was a Beauty Blender – and I don’t really blame her for that one. Still, at such a tender age (and with no offers to do the washing up on the table) she has no need for my Rose Balm Intense, which afterall.. is for very *dry* hands. Not very *little* hands. …nor very little teeth. Grrr. For the five consecutive nights that I was able to apply the handcream… I formed the opinion that it was certainly softening on my rough bits but not a product that I’d want to use during the day. It’s heavy and sits on the skin in the way I love my Lanolips 101 to do… but I just don’t love the same feeling on my hands. 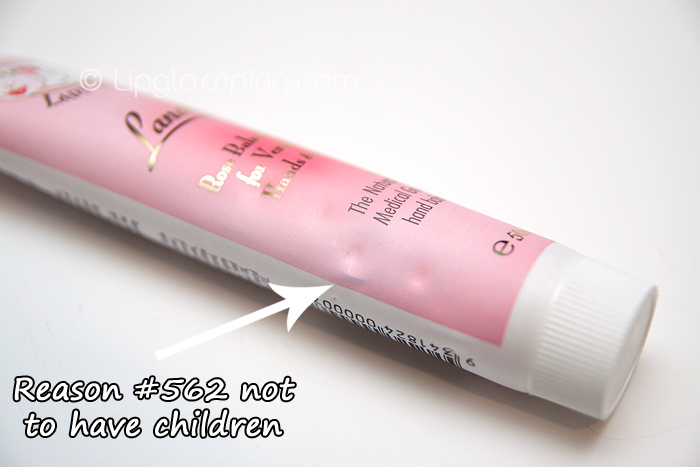 It’s strongly rose-scented and you only need the smallest amount to get good coverage. After 4 days, it was beginning to heal my sore cuticles before it was rudely snatched from my routine. I’d recommend it for when your usual cream isn’t cutting it. Combined with a pair of cotton moisture gloves, I think it would make for an intense and quick-fix overnight treatment. 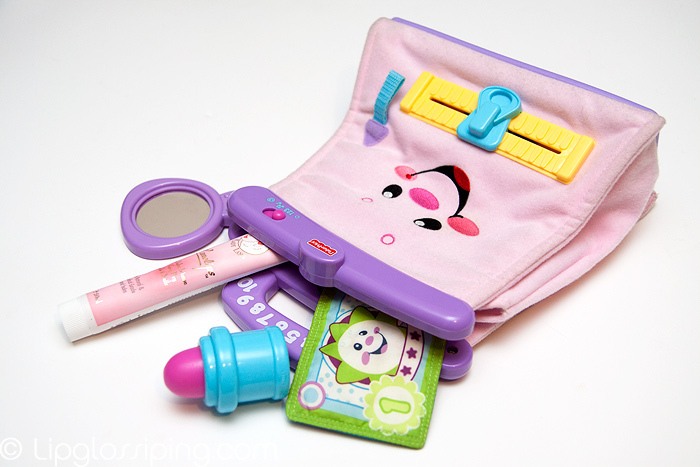 Or yano, a great addition to your toddler’s handbag. 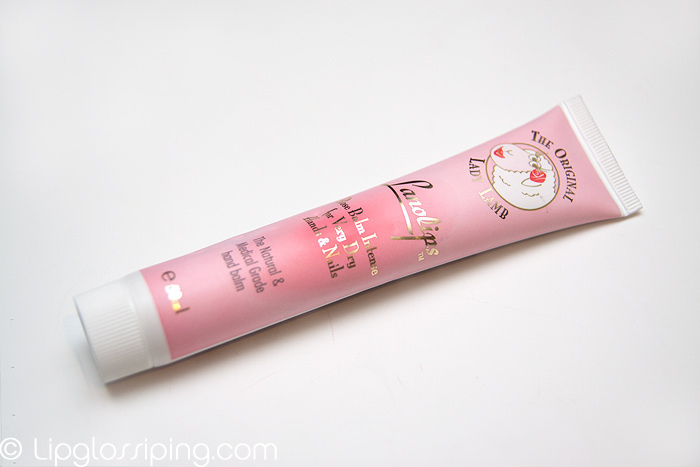 Lanolips Rose Balm Intense is priced at £8.99 for 50ml and available online or instore in Boots. I can’t get past the smell of it, to me it smells of strong powedery babies. I haven’t jumped on the Lanolips bandwagon just yet but I like the sound of this…I might have to give it a quick sniff first though before I buy it! You should get Leila to do a what’s in my purse video…that would be hilarious!! I love my Lanolips 101 for cuticles as well, which are always in a shameful state due to nail biting and frequent handwashing. My daughter has the same handbag, I do hope I don’t find some of my makeup in there! AMAZING post! Brightened a dull,drizzle filled Monday morning a treat!!! Personally I think you are lucky,I have a 9 year old boy who will not be converted to the JOY of make-up,skincare,tanning,shopping. I tested the intense version in Boots and I was torn whether to get this or the everyday as my hands are forever dry, but I went for the everyday one so I can use it at work (and also you get much more). Leila’s beauty tales are adorable, she has good taste. I really need to catch up with the Lanolips wagon, because their stuff sounds fantastic … but I think I’ll start with the straight up basic lip balm and see how I go from there. This stuff does sound great for overnight, … especially because, guess what? There have been studies done that pleasant smells (apparently especially rose) can lead to better sleep 😉 Bonus. This sounds just lik what I need for my dry hands..
And lol. Leila is adorable! That is too cute, love the little handbag shot. I’m currently having baby loving makeup issues. A’s particular preference is for Ellis Faas lipsticks. She can get them open and knows they are for the mouth area in her case in the mouth rather than on it. Ewwww…. I might have to get a tube of this as I struggle with dry hands and often need to resort to heavy cream and gloves at night. It’s all that bottle washing that does it! Hahaha that is so cute. Lucky Leila that she has a mummy with so much makeup and beauty products to raid! hehe dont ya just love lil girls..
She’s so cute! 😛 Loving the handbag photo. That is so sweet. I wish I had such a fierce handbag when I was her age! Keep meaning to try Lanolips, especially the lip balm but I keep forgetting to look out for it in Boots. I’m giggling at your misfortune but I’ve been there. Next is when they outright swipe it and actually use it and conveniently “forget” to give it back. Aww, such a sweet post! ha ha, my 20 month old daughter has that bag too, though she much prefers to carry mine about! Illamasqua Hollow Cream Pigment as a contour for pale skin? Tampons! um... direct to your door?